There are many different types of makes and models of cars to choose from. The same goes for trucks. A lot of consumers prefer to go with the purchase of a truck. They feel that there are a lot of extra advantages to doing this. Plus this type of vehicle fits in with their lifestyle. When choosing a truck one of the choices is to go with a 4 x 4. But the new truck owner wonders what this is going to do to the insurance rates. 1 What is the 4 x 4? 2 Are 4×4 Trucks More Expensive To Ensure Than Cars? 3 How Much Does It Cost To Ensure A 4×4 Truck? 4 What Is The Cheapest 4×4 Truck To Ensure? 6 What Makes The Insurance Companies Vary In Their Pricing? What is the 4 x 4? For those that are new to trucks, they may not have the right understanding of what a 4 x 4 means. It means a four-wheel drive. When driving this type of vehicle, the outside tires spin faster than the inside tires when taking a turn. A lot of people like the 4 x 4 truck versions when they are driving in bad weather conditions such as heavy snow. This system allows the particular wheel that is not getting the right traction to get the most power. Are 4×4 Trucks More Expensive To Ensure Than Cars? As with cars, there are many different makes and models of trucks. The 4 x 4 truck is just one of these versions. The answer to whether trucks are more expensive comes down to it will all depend. Many different metrics for assessing a truck for insurance purposes. How it measures up will determine the cost of the premiums. Some of the metrics that are taken into account are the size and weight of the truck. A larger truck may be able to hold more passengers. A heavier truck may fare better in a collision. Then the insurance company will look at the negative factors. Those that are affiliated with the truck. They may take into consideration that a heavier truck could cause more damage. If it were in a collision with another vehicle. It might also be one that is appealing to thieves. These are the same type of metrics that apply to cars. How Much Does It Cost To Ensure A 4×4 Truck? Each year the rates for vehicle insurance change as it pertains to a specific make or model. A 4 x 4 truck from 2015 may have been more expensive to insure then it would be in 2017. Also, a 4 x 4 has a higher price tag compared to some of the other makes and models. It is something else that the insurance company will take into account. The replacement cost of the 4 x 4 may be more of an expense for the insurance company. So to lower the risks, they are going to charge a higher premium. Most insurance companies will put a larger premium on the larger high-end model trucks. When buying a 4 x 4 the premiums are going to fluctuate depending on which particular 4 x 4 needs insuring. What Is The Cheapest 4×4 Truck To Ensure? It is difficult to give a definitive answer. Based so many variables that the Insurance Companies have to keep in mind. But often the 2018 GMC Canyon truck seems to be one of the cheapest trucks to drive in Ontario. In many of the major areas of the province. Out of ten of the cheapest trucks to ensure this particular truck took the first spot for some experts. In the mid-range of the top ten trucks is the Nissan Titan. It seems to be one that many insurance companies feel is a truck that deserves cheaper premiums. Then the one that just made it to the list of cheap trucks to insure is the Ram Pickup. These are all best-selling trucks for the 2017 year. The Ford F series is the top selling truck in Canada. Yet many find the insurance rates are higher for this series. It could be due to the high theft rate that is present with this particular line of trucks. Theft is something that the insurance companies worry about when determining premiums. As mentioned the size of the truck and its capacity are two important factors. They can affect the cost of the insurance for the 4×4. As well as the cost of the truck to buy. Then added to this are going to be other points that the insurance company will take into account. Where the truck is going to driven and the neighbourhood it is may be other factors. Another important thing will be what the truck’s used for. Many individuals choose to buy a 4×4 because they are going to use it for their business. These truck owners should realize that they will need commercial insurance. They cannot rely on personal insurance. It is not wise to use a truck for business and rely on personal insurance. Plus, it could invalidate the insurance. Being honest with the insurance company about what the purpose is for the truck is important. What Makes The Insurance Companies Vary In Their Pricing? It can be confusing for some individuals to understand why insurance can vary in price. 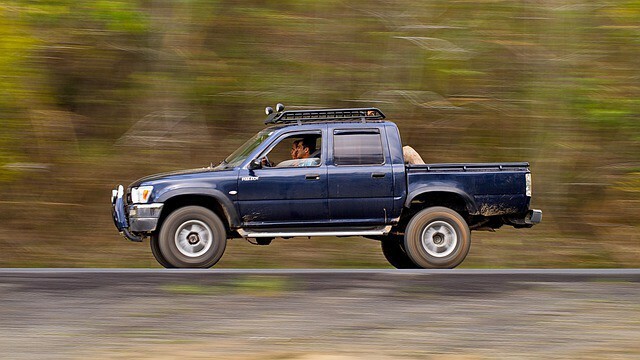 Two people can own the same 4×4 truck, but their insurance rates are different. There are several reasons for this. Every insurance company sets their level of importance on the many different metrics that they use. Some may be more concerned about theft than others. There may be some that put more emphasis on passenger capacity. Insurance companies rely on a lot of different resources to help them set their premiums. One of these resources is their internal data. They keep track of the claims made. A specific 4×4 truck could generate a specific number of claims. Based on this they may price the premiums for it a little higher. Yet, another insurance company may not have had as many claims for that same vehicle. Those interested in buying a specific truck should not hold back just because of insurance costs. Instead, they should become proactive in looking at other ways they can save money on the premiums. Many times this is possible through different kinds of discounts.